NATURAL HABITAT AND PREFERRED SITE: Native of Japan and China, cultivated in the United States and escaped to various parts of the south now. It grows well in a wide variety of soils from sand to heavy clays. IDENTIFICATION INFORMATION: Distinctive upright tree with smooth green bark, a rounded crown and very large leaves and dramatic seeds that mature in the fall. FLOWERS AND FRUIT: Yellowish-green flowers in June or July followed by showy brown fruit. Flowers are 4 to 12 inches long, terminal panicles, male and female plants on the same tree (monoecious). BARK: Unusual smooth green bark even on the mature tree trunks. FOLIAGE: Leaves are alternate, simple, deciduous fall color is yellow. 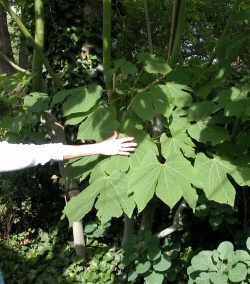 Leaves are large 5 to 18 inches, usually 3 blades, dull green, slightly hairy above and below. CULTURE: Parasol tree is easy to grow in a wide range of soils given a moderate amount of moisture and fertilizer. It is relatively drought tolerant. PROBLEMS: Few serious problems other than the tree has weak wood and is relatively short lived. Some people think it is too coarse. I think it is an interesting looking tree, although I wouldn’t plant a lot of them. PROPAGATION: Easy to grow from seed planted fresh immediately after maturing. They can be saved at cool temperatures for some period of time. INSIGHT: Parasol tree is easy to grow from seed. It can become a pest from seedlings popping up all over the garden unless the beds are heavily mulched.